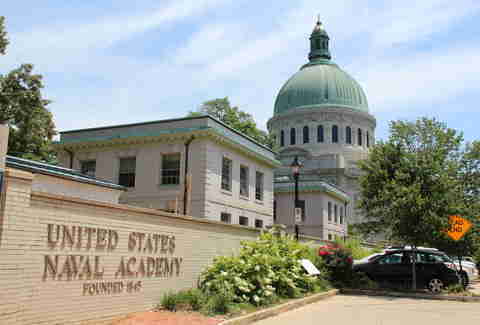 If Canada is America’s attic, then Annapolis is DC’s attic: you forget it exists until you visit and realize how much cool stuff is going on up there. Less than an hour’s drive northeast, this city -- dubbed the sailing capital of the nation -- has Instagram-worthy scenery, great eats, maritime adventures, and no shortage of historical tidbits for your next trivia night. It's totally worth making the short drive to discover what’s been hiding up there. Naturally, there are plenty of opportunities to cruise around Annapolis by boat. Schooner Woodwind sailing cruises give you the full sailing experience without all the trouble of actually knowing how to sail. It offers two-hour sightseeing or sunset sails, as well as food and wine cruises, overnight "boat and breakfast" stays, and multi-day long-distance adventures, all on a 74ft wooden schooner. For a more budget-friendly way to get out on the water, take the Water Taxi and enjoy the views as you zip around the harbor. If you prefer to stay on land, opt for a Discover Annapolis trolley tour, which takes you past City Dock, the Maryland State House, colonial mansions, the United States Naval Academy, and more. Annapolis has both, after all, which means we like them twice as much. Great Frogs Winery on Harness Creek Vineyards has been around since 1999, but just opened its tasting room two years ago. Visit the winery to walk the grounds, explore the old tobacco barn, and do a tasting ($25, reservations requested). And on the last Friday of the month, from May through September, Great Frogs hosts its Date Night Series, where couples can enjoy music, pizza, and wine. For hops enthusiasts, there’s Chesapeake Brewing Co. of Annapolis. The beer is brewed across the Bay in Crisfield, but Annapolis is home to the pub, which opened this year. The brewer is a graduate of the U.S. Naval Academy, so there’s a Beat Army Golden Lager on tap at the bar. 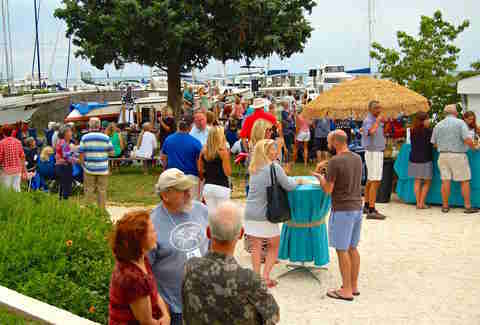 The brewing company also hosts the Annapolis Crab, Crash & Cruise every first and third Sunday of the month from June through September, one of the best date nights in the state. 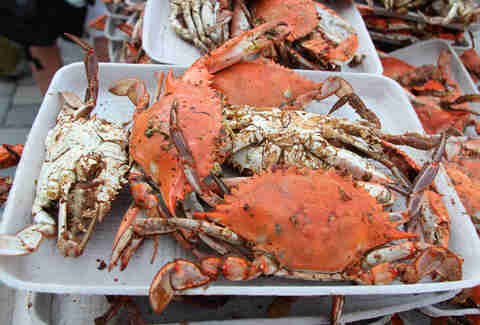 Feast on steamed crabs, fried chicken, corn, beer, and Smith Island cake (that's the Maryland state cake, because they have one of those), then cruise the Annapolis Harbor at sunset. 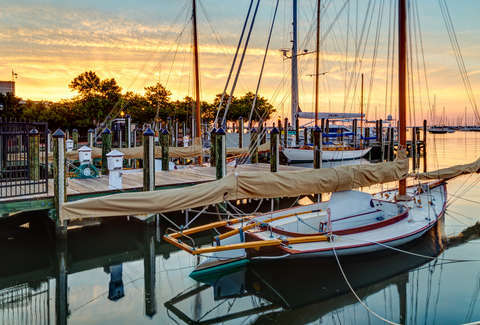 Waterfront dining is on point in Annapolis, so get your fill of seafood and drink like a sailor at one of the many restaurants lining the water, like Carrol's Creek Cafe, O'Learys Seafood, or Severn Inn. Off the water, try brunch at Iron Rooster or Double T Diner, and grab a late-night slice of pizza at the street-level counter of Charlie’s Bar at Mangia. On Wednesday evenings, from July through September 21st, you can dine outdoors during the city’s Dinner Under the Stars event: the first block of West St from Church Circle to Calvert St is closed to traffic, and restaurants will set up tables in the street. Participating spots include Rams Head Tavern, El Toro Bravo, and Tsunami. Pro tip: always top off your meal with ice cream from Annapolis Ice Cream Company. Choose one of the seasonal pie flavors (which are made from actual pieces of house-made pie mixed into vanilla ice cream), and thank us later. When in Annapolis, do as the Annapolitans do: Annapolis Sailing School offers rentals and lessons for a wide range of abilities. Courses range from basic fundamentals and skills introductions to certification and proficiency tests, and you can learn on a small keelboat or a larger cruiser vessel. Book a fishing trip into the Chesapeake Bay with one of the area's many fishing charters for a chance to catch everything from striped bass and trout to crabs. Most are available for both half-day and full-day rates, and this is a great excuse to grab a bunch of friends and catch up over a day on the water. If you’re not ready to jump on board a ship quite yet, there are other ways you can participate in the city’s sailing culture while keeping your feet firmly planted on the ground. 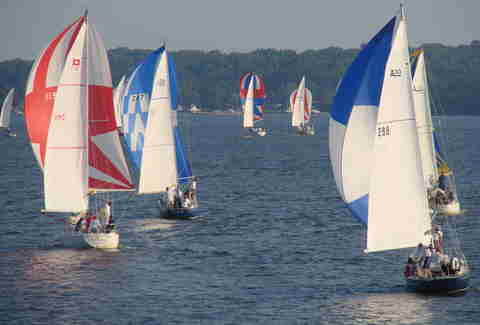 From July through August, catch the Annapolis Yacht Club’s Wednesday Night Races. 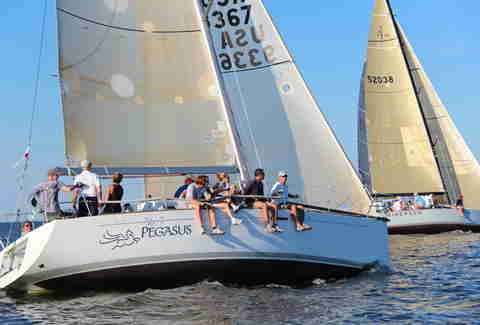 More than 125 yachts compete in these midweek races, which involve sailing around several marks in the Bay, before heading back to Spa Creek for a finish in front of the Clubhouse. Grab a spot on the drawbridge or around the Harbor to see the race. The United States Sailboat Show runs from October 6th through the 10th, and the Powerboat Show runs from October 13th through the 16th, so the whole month is basically devoted to drooling over gorgeous watercrafts that are far, far outside our budgets. More than 50,000 boating enthusiasts from around the world come for this one, so it's really a sight to behold. The City Dock in Annapolis' harbor is known as Ego Alley because captains come here partially to show off their boats -- and their boating prowess (or lack thereof) -- as they navigate this narrow passageway, where crowds of onlookers watch from all the surrounding shops and restaurants. Relatedly, this place is also a prime spot for people-watching. The entire Downtown area is an impossibly quaint place to spend a few hours exploring. Walk on the narrow cobblestone side streets and check out the adorable row houses. Civilians with photo ID are permitted on the scenic campus, called the Yard, and tours are offered daily from the Visitor Center. Check out the Gallery of Ships in the museum at Preble Hall, and the new high-tech exhibit that greets visitors with interactive screen displays, including a map of the Yard and photos of the Academy’s most iconic moments. Catch a football or soccer game in the fall, or a lacrosse game in the spring. (The anticipated Army-Navy football game is in December.) During October through April, time your visit so you can watch all 4,500 midshipmen form up and process into King Hall for noon meal. Soak up some nature: Quiet Waters Park in Eastport is 340 acres of green space, with six miles of paved trails, gardens, art galleries, gorgeous views of the East River, and a beach. The kid- and dog-friendly park is great for running, and frequently has events going on during the weekend, like the free Summer Concert Series in July and August. Greenbury Point is a less-crowded trail that offers nature trails and great views of the harbor and the Bay. A little further out of town, Sandy Point State Park is an ideal spot to picnic or camp on the beach. It’s located right under the Chesapeake Bay Bridge, so the views are stunning. Long-distance bikers may also enjoy the Baltimore and Annapolis Trail, which links the two cities via paved trail. Leave your pride at home: Annapolis is home to the second-largest Renaissance Festival in the country. This outdoor event is celebrating its 40th season at Revel Grove, which is 15 minutes away from Downtown. Bring your stein, feel no shame, and cosplay your way through the 16th-century English village, presided over by King Henry VIII. 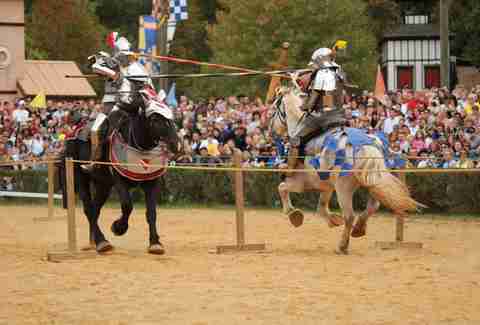 Every weekend, from August 27th through October 23rd, the festival comes alive with more than 200 entertainers, 10 stages, a 3,000-seat jousting arena, 122 craft shops, and 48 food & drink stands. For the factually inclined, Annapolis has lots of museums where you can learn about the area's history. The Hammond-Harwood House is a historic mansion that features impressive woodcarving and plasterwork, and highlights 18th-century arts and architecture. The Banneker-Douglass Museum is Maryland’s official museum of African-American heritage. Admission is free, and current exhibits explore African-American weddings in Maryland, African-American lacrosse pioneers, and African-American history from 1633. The William Paca House and Garden was built in the 1760s by William Paca, who was one of Maryland’s signers of the Declaration of Independence. It was restored in 1965, and is now a National Historic Landmark. Guided house tours and self-guided garden tours are available daily from March through December. Every Thursday from July 7th through August 25th, the Annapolis Maritime Museum hosts free concerts on the beach (donations appreciated), and every first Sunday, from August through November, 100 local artists, crafters, and performers set up shop along the first block of West St and Calvert St for the free First Sunday Arts Festival. Enjoy live arts, crafts, music, dance, street performers, and food. All year long, the Art in Public Places Commission invites you to tour the city like you would an art gallery; they’ve created a catalog that highlights the monuments, sculptures, murals, stained glass, cemeteries, landmarks, and museums throughout the city. This beautiful piece of architecture is the oldest state capitol still in continuous legislative use. It’s also where the Continental Congress met from November 1783 to August 1784, during which time George Washington resigned as commander-in-chief of the Continental Army. Today, the Maryland General Assembly and the state leadership use it to conduct business. The Old Senate Chamber just reopened after three years of restoration, so now is the time to check out the old/new attraction. Self-guided tour information is available daily. Lani Furbank is a freelance food writer who wishes she could sail, but will settle for watching boats while sipping craft beer and putting Old Bay on everything. Follow her on Twitter and Instagram @lanifurbank or read her blog at www.LanisCupOfTea.com.